SPCA went to inspect Muks Muks previous home. 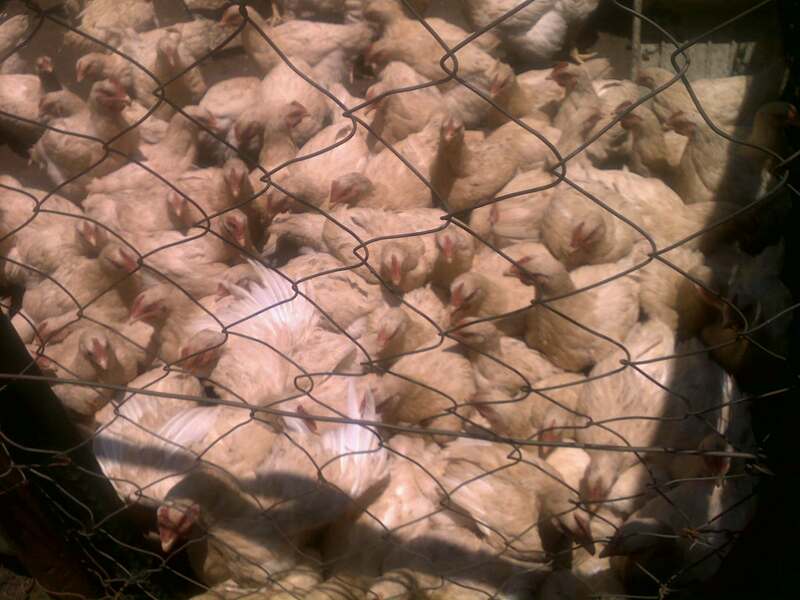 Broilers did have food and water at time of visit. Pleased that they had followed through on my chat to them on Sunday, but also means SPCA not able to confiscate. Lack of shelter not deemed to be adequate. Owners have been given till today to either send chicks to abbatoir, or provide proper shelter. Owners have been told to upgrade pen for pigs. Apparently hutch that rabbit is in is ok, as she can turn around (!). We have poor laws and standards set for animal welfare. This does not take into account the psychological or real physical needs of a bunny. I hope these chicks have gone to abbattoir, and their nightmare is over. Muk Muk is a lucky girl. I have to believe that there is a greater plan, when I look at Muk Muk and wonder how she in particular ended up in my arms on Sunday, and went from chicken hell to a good life. I am not sure she knows how narrowly she escaped death this week, and a particuarly cruel death. Its her journey, and mine. I am sorry we could have not done that for all those little broilers. Muk Muk doing well. Her wound is still stinky and rotten, but each day we manage to remove a little more of the infected flesh. Doing it slowly to try and limit distress and discomfort.